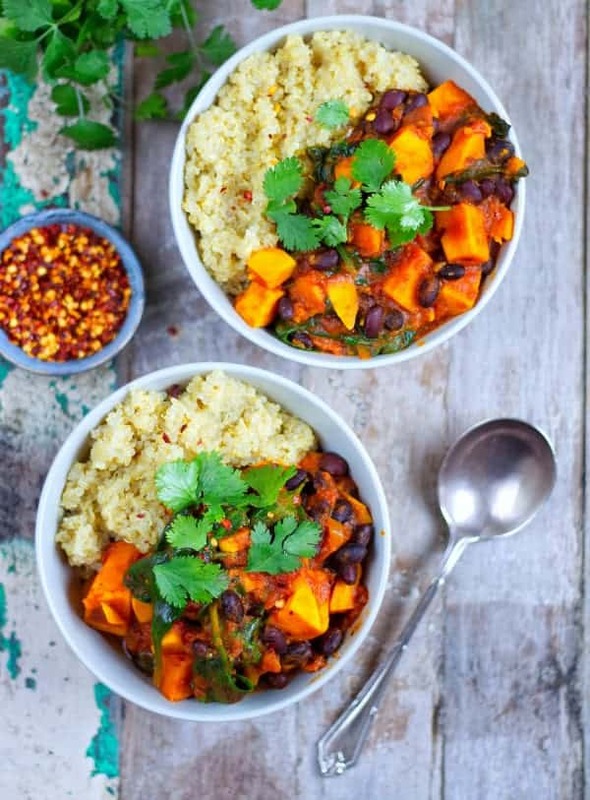 This Sweet Potato & Black Bean Stew is the perfect comforting dish to make during this cold weather. It is so simple to make and extremely inexpensive, costing around £4-£5 for the whole dish. That is roughly £1 a portion!!! 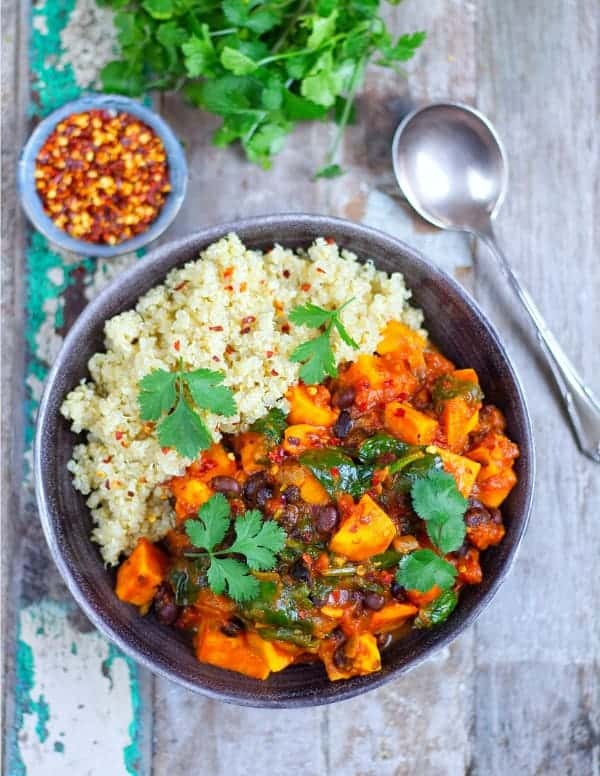 It’s gluten free, vegan and is absolutely packed full of colour, flavour and goodness. 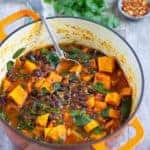 You can always adapt this recipe to use what you have, for example swap the sweet potatoes for butternut squash and the black beans for lentils. 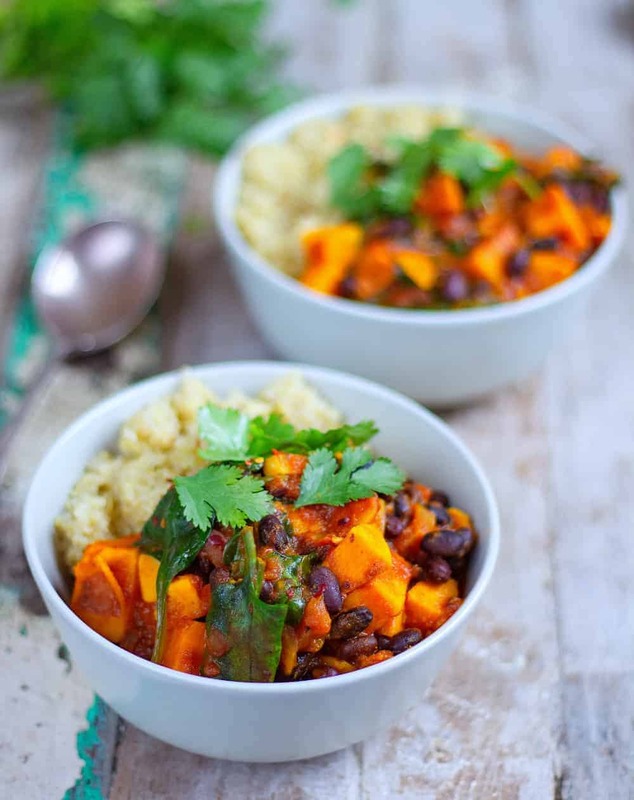 If you try this Sweet Potato & Black Bean Stew let me know! 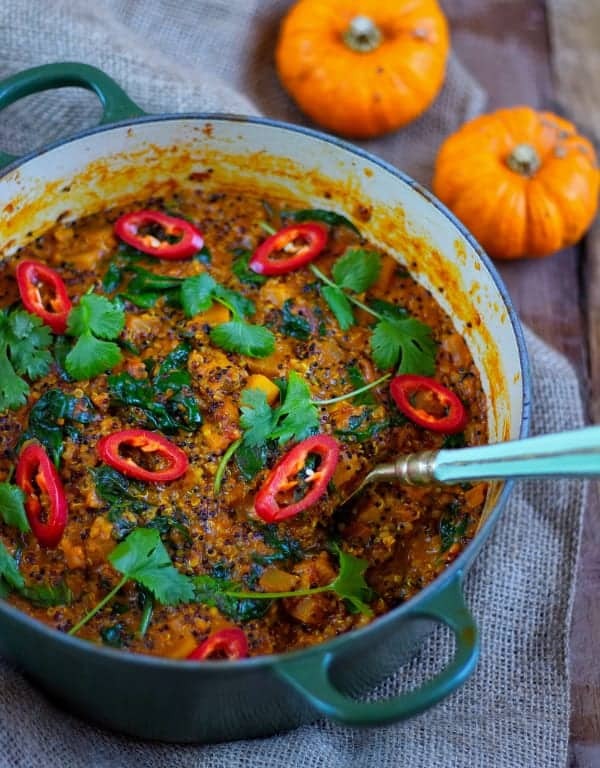 Trust me this will become one of your weekly staples during the colder months! Warming, allergy free, tasty and family friendly. Always make extras as this tastes even better the next day! You can store it in an airtight container in the fridge for up to a couple days or freeze it down to enjoy another day. Try serving it with a side of quinoa or brown rice. You can refrigerate this in a sealed container for 2-3 days. It is also suitable for freezing so you have a quick and healthy meal another day. I have just tried this recipe and it is delicious. It was so simple to make and the aroma’s in the kitchen smelt amazing. My partner doesnt eat veg at all and im still trying to get him to embrace the thought of a plant based diet. He tried this and couldnt get over how tasty it was. Thankyou so much for sharing this recipe. Look forward to trying more of your recipes. I followed the recipe exactly and it’s soooo good! I forgot to make the rice so I ended up eating it by itself and I’m glad I did because I had room for seconds. Wondering if it freezes well? Really pleased you enjoyed the recipe and thank you for sharing your feedback! Tried this out tonight. Not sure where I went wrong but I really struggled with the acidity of mine. I suspect that I was probably too generous with the crushed chilli, that or the tomato puree I used is just too concentrated. I used mostly Tesco ingredients (Tinned tomatoes, puree) and Marigold powder to make my own stock. It would be good to cross check with some of the successful people here as to which products they used. I’ll give this another go and rate accordingly – thanks for the recipe. Thank you for leaving your feedback. Sorry you felt it was a little too acid for you. Not had that feedback so far. I actually use Tesco myself for the tomatoes and puree and also the same stock. I guess its a very tomato heavy base to this dish and some may find that a little strong but the sweetness of the potato should help to counteract that. You could add a little honey or maple to help sweeten it if you feel it’s necessary for your taste buds. I had the same issue with a previous meal and you’re right that’s canned tomatoes from Tesco(the cheapest one as far as I remember! ;))))I used passata for this one and it worked out well, really delicious!!! Hi James, I think this was my fault. The tomato paste from Tesco is ‘double concentrated’ and I probably went a bit OTT with it. I’ve had another go and it’s come out really well. Thanks! Wow cooked this dish tonight, it was absolutely delicious! All three of us loved it, I served it with quinoa, really filling and plenty left over for another day. This is the third recipe of yours we’ve tried and really impressed so far, looking forward to trying more. Hey! I’m looking forward to trying this. Have you tried it in a crockpot by chance? Hi James! I tried this recipe last night and it was so good and fulfilling! My apartment smelled amazing and I could still smell the aroma when I woke up this morning! 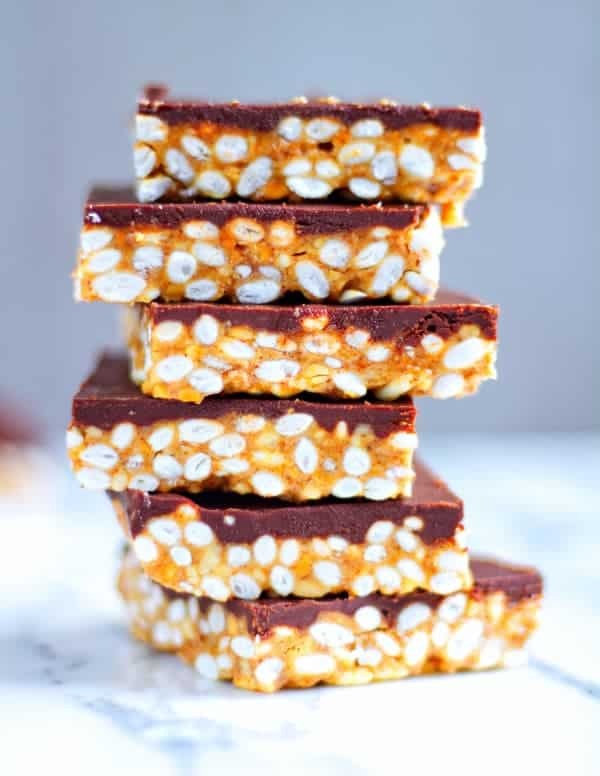 I am adding this recipe to my list of go to’s! Yay, so happy you enjoyed it and thank you for sharing your review. Hello there! I was wondering if this could be done in a slow cooker and if so if anybody had suggestions on the cook time? I personally haven’t tried it in a slow cooker. I had been meaning to give it a go at some point though. I wonder if the sweet potato would get overcooked and go mushy. I would start with say low setting for say 7 hours, would love to know how you get on if you try it. Interested to hear if anyone else has tried it though? SO SO SO good. Thank you James!! Aww thank you so much Allison 🙂 so pleased you enjoyed it! I’m just preparing this now, ready for this evening’s meal. Smells divine! Hello – Do you use whole canned tomatoes? Thank you. I use 2 cans of tinned chopped tomatoes 🙂 hope that helps. Such a great dish! I’ve made this twice in the last month – once just for my boyfriend and I and another time when cooking for a large crowd (I tripled the recipe and added corn and the flavor still came through very nicely!). I got tons of compliments on this and will definitely be adding it to my regular recipes list 🙂 Thanks for sharing! Thank you! I’m going to make right now. Can’t wait! We are not vegetarian but enjoy eating vegetarian meals twice a week or more. Just made this lovely tasty stew, recommend by my sister, who loves it. My husband and I thought it was great. One for my recipe file thank you , no going to check out some of your other recipes to try. This is so easy to make and is delicious. I have to admit, I was sceptical as during the simmering the taste of turmeric seemed to overpower the dish a little, however ‘fully cooked’ the flavours are absolutely perfect and I’m so glad I’ve made it! I love this type of dish as I can freeze portions for the days when putting a healthy and nutritious meal together is just not going to happen! Thank you for sharing this wonderful recipe! P.s. I’m a hungry Horace and I got 6 portions out of this recipe. Yay so pleased you enjoyed it PeeBee! Thank you so much for sharing your feedback. Aww thank you so much Rosalind! So happy you both enjoyed it 🙂 enjoy all the other recipes. I put all of the ingredients in a slow cooker and it turned out great! Very tasty and healthy. What a beautiful dish! My 9 month old could not get enough! My picky 3 year old wouldn’t eat the beans and lentils I put in but did love the sauce which is a big thumbs up! I had run out of tomato paste so did not add any, or any chilli and only added a small dash of cayenne pepper so that it was suitable for my little girls. A really lovely tasting dish. Yay so pleased, thank you for leaving feedback Joi! I loved the recipe. For my leftovers I plan to freeze for an easy dinner. What would you suggest on the best way to reheat the leftovers? Hey Maria, so pleased you enjoyed it and thanks for leaving a review! You can either reheat in a pan on a simmer (you may need to add a little bit of water) or use a microwave if you prefer. I have now made this twice and it’s a fabulous recipe! Thank you! Easily enough for four, so I halved the recipe the second time. First time, as I had so much, I ended up adding the spinach to one half, as per the recipe, then I added mushrooms and red pepper to the other half and topped with mashed potatoes, leeks and vegan cheese to make a sort of vegan cottage pie. I liked this recipe, but next time i’ll use more vegetables and less potatoes. Thanks! Just made this today and it turned out great. Very pleased with it and it tastes so good, will definitely be making again. Yay! So pleased you enjoyed it Cheryl 🙂 thanks for sharing your feedback! This was so simple to make and the spice level was great! Thank you! Yay 🙂 so pleased you enjoyed it Zeinah! Thanks for sharing your feedback. This is delicious and very quick. I am thrilled to have another reliable, easy, and healthy recipe to add to my limited repertoire. So pleased you enjoyed it Abby 🙂 thanks for sharing your feedback!